You get a call, saying that a loved one has been kidnapped. The caller may make threats, demand money, or lead you to believe that your loved one is in danger. But... is the caller who you think it is? Scammers are good at pretending to be someone they're not. They can be convincing: sometimes using information from social networking sites, or hacking into email accounts, to make it seem more real. And they'll pressure you to send money before you have time to think. Stop. Check it out. Try to contact the loved one who you are concerned about, or call friends or another family member. Keep your information (and your money) safe. Never give out personal identifying information, such as bank account or credit card account numbers, to anyone you do not know. And never send money to an unknown person. Pass this information on to a friend. You may not have received one of these calls, but chances are that you know someone who will - if they haven't already. 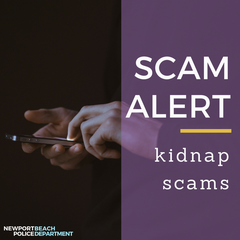 If you believe you’ve been the victim of a scam, please file a complaint with the Federal Trade Commission at ftc.gov/complaint.